A creamy truffle made with soy milk, chocolate and sugar. 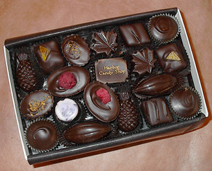 Plain Dark Chocolate, Dark Chocolate Pomegranate & Raspberry. To ensure freshness, please enjoy within 2 weeks. Refrigeration recommended, but to maximize flavor, serve at room temperature.